The Austin Contact Center Alliance is proud to announce the 20th Annual Fall Symposium on Thursday, September 13, 2018 at the UT Commons Conference Center (J.J. Pickle Research Center). 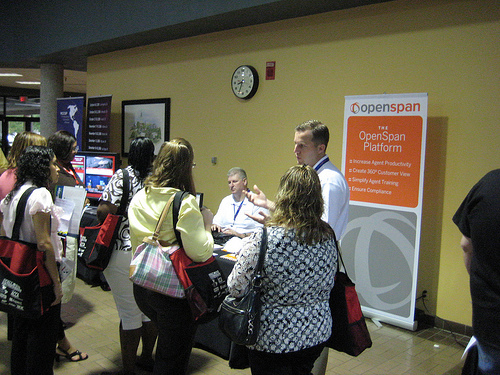 The symposium offers the best resources and networking opportunities to contact center professional in Central Texas. This year we anticipate more than 200 visitors from all areas of Central Texas, including Austin, Round Rock, Georgetown, Taylor, Houston, Temple, Killeen and San Antonio. Your participation and support is key to making this year’s symposium one of the best yet. We can’t wait to tell them you’ll be there! >>Register as an Exhibitor or Sponsor Now! •· All sponsorship agreements and payments must be received by the ACCA no later than 30 days before the event. •· Inserts and promotional materials received by the ACCA no later than 30 days before the event. Should your organization have a specific need, sponsorship idea, or in-kind suggestion for sponsorship, please contact us at info@austincontactcenter.org. We will be happy to explore a way to meet your needs.